Need a loan to help pay for college? Consider federal loans first! Federal student loans: These loans are funded by the federal government. state agency, or a school. If You Need to Borrow Money to Pay For College or Career School, Start With Federal Student Loans. 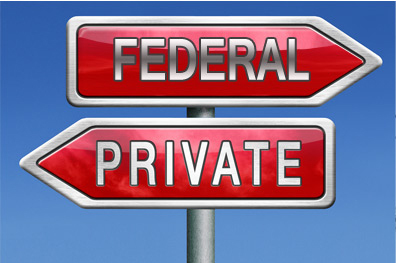 What Are the Differences Between Federal and Private Student Loans? Federal student loans include many benefits (such as fixed interest rates and income-based repayment plans) not typically offered with private loans. In contrast, private loans are generally more expensive than federal student loans. The chart below provides a summary of the differences. The interest rate is fixed and is often lower than private loans-and much lower than some credit card interest rates. Private student loans can have variable interest rates, some greater than 18%. A variable rate may substantially increase the total amount you repay. Undergraduate students with financial need will likely qualify for a subsidized loan where the government pays the interest while you are in school on at least a half-time basis. You don't need to get a credit check for most federal student loans (except for PLUS loans). Federal student loans can help you establish a good credit record. Private student loans may require an established credit record. The cost of a private student loan will depend on your credit score and other factors. You won't need a cosigner to get a federal student loan in most cases. Loans can be consolidated into a Direct Consolidation Loan. Learn about your consolidation options. Private student loans cannot be consolidated into a Direct Consolidation Loan. There are several repayment plans, including an option to tie your monthly payment to your income. You may be eligible to have some portion of your loans forgiven if you work in public service. Learn about our loan forgiveness programs. It is unlikely that your lender will offer a loan forgiveness program. To get a federal student loan, you must first complete the Free Application for Federal Student Aid (FAFSASM). Learn more about applying for aid. Start here to find out current info. Grants don't have to be paid back.